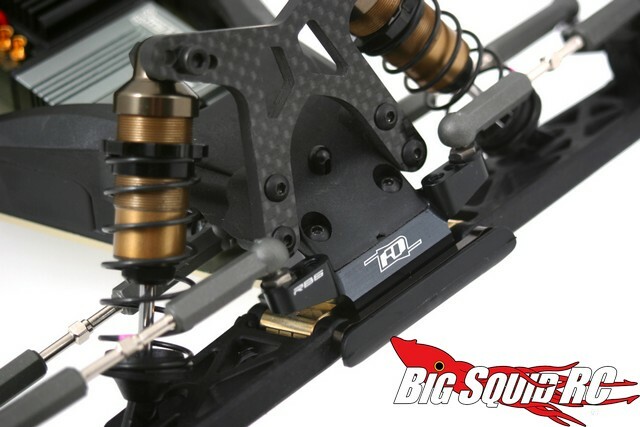 Revolution Design Aluminium Bulkhead for Kyosho RB6/RT6/SC6 « Big Squid RC – RC Car and Truck News, Reviews, Videos, and More! Revolution Design Racing Products have been putting out some pretty snazzy upgrade parts lately, their latest is an aluminum front bulkhead for the Kyosho RB6 Buggy. The bulkhead is made out of 7075-T6 aluminum making it much stronger than the stock plastic part and will eliminate ripped out ballstuds. RDRP parts are known for looking trick and the RB6 front bulkhead is no exception. It is anodized black and laser etched so the guys you bash can clearly see it’s an upgrade part. The part number for the bulkhead is #RDRP0202 and you can get complete information by hitting up This Link over on the official RDRP website.